On your farm you'd generally just have a single cropping tracker - and within that tracker you'll be able to have unique crops within unique seasons if you need to. In your main Operations tab, hit New operation tracker and on the following page select Cropping from the list provided. On the screen that follows, you'll be able to immediately begin configuring your cropping tracker. You'll need to give it a name and select your standard payment terms. Once you've done that, you can add in your crop types as well as your direct cost types and accounts. The information in your crop tracker are unique for each season, as such if you set up your 2018 cropping tracker to have five crop types - you'll need to replicate that in your 2019 cropping tracker settings too. To add a new crop type, select your desired crop type from the dropdown and select Add crop type. You'll then be prompted to give it a label (this will be how you report on the crop) as well as map a sales account. If the crop types available aren't what you're after, or you would like to change the default units (weight) the crops use - you can click Manage list and you'll be able to make those changes. If your crop types have different grades i.e. Premium and Standard, you can add these in. Select Add grade and add the name of your desired grades. Along with recording information directly relating to the crops, you can also record all costs associated with your crops too such as freight, fertiliser, or seed costs. There is no limit to how many direct costs can be setup in your cropping tracker. Select your desired category, and then click Add direct cost category. Select your direct cost account (which comes from Xero). 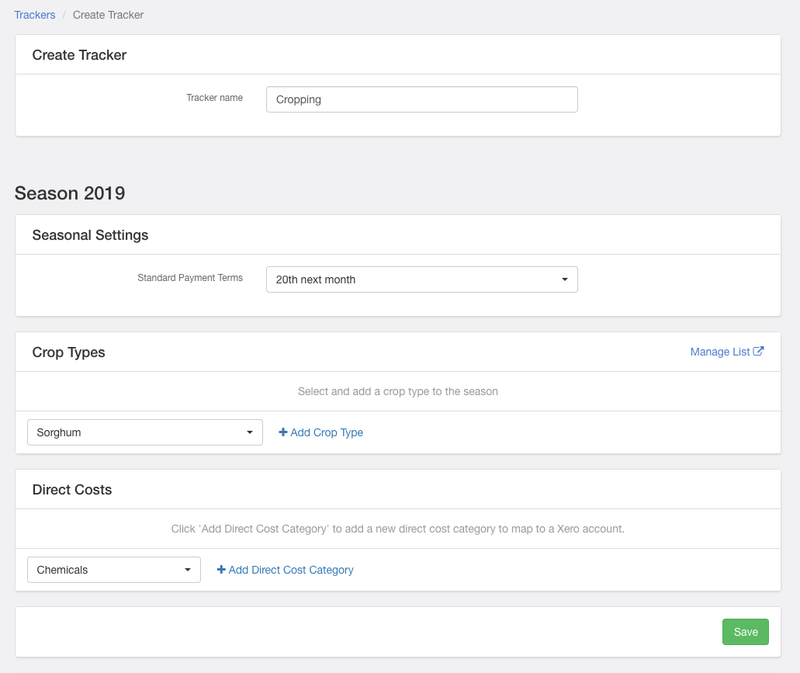 Once you're happy with your crop types, grades, and direct costs - you can select Save and your cropping tracker is now fully setup for your new season.